Thought I would share some of the items I use all the time in my projects. None of these products are particularly expensive, in fact, they are downright inexpensive. (okay – that isn’t really true. Half of these are really really inexpensive and half are luxury but hey, opulence? I has it…I like the best). The items I’ve grouped into this post are are singularly valuable to me because they are all top notch products and align with my own self-interests. I have used these in my own house and they are great. Simple, purposeful, and modern. It also helps that for some reason, this brand – and these door stops in particular – aren’t on everyone’s radar. As a result, most people see them and react as if they are rare, precious, and valuable items which they are not. If you are particularly observant, you will realize that the picture I have shown here has the door stops in an unusal location (for most but not me). This door stop is up high on the wall in my bathroom and locating it here kept it from sticking out from the wall in a spot where I know I would hit it with my foot every time I rounded the corner out of our closet. Another added benefit is I can place hangers with clothing from this spot and it isn’t ever in the way. Homasote Company is the nation’s oldest manufacturer of building products from recycled material, fiberboard products made from post-consumer recycled paper, containing no asbestos or formaldehyde additives. Each ton of recycled newsprint conserves about 300 cubic yards of landfill space. Each year Homasote building products help conserve more than 1,370,000 trees and eliminate more than 100,000,000 pounds of solid waste each year. Each production day up to 250 tons of post-consumer paper are recycled into Homasote®, diverted from waste stream disposal into landfills or other methods. All water used to manufacture Homasote® products — hundreds of thousands of gallons per day — is completely recycled in a “closed loop” system. Homasote Company established this system in the 1950s and was recognized by the U.S. Army Corps of Engineers (precursor to the EPA) as is one of the first paper mills in North America to establish this water-reusing system. Inspired by contemporary Scandinavian furniture, Solna’s crisp lines and beautifully simple form deliver BRIZO’s sleekest kitchen to date. 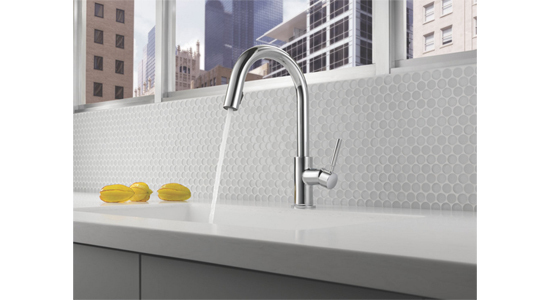 Both the kitchen and bar/prep models feature a completely new “hidden” pull-down spray wand held in place with MagneDock™ Technology, allowing Solna to maintain its clean, modern form when the wand is docked. Who doesn’t love nugget ice? I know I do and based on the pleading requests from our clients, I am not alone. 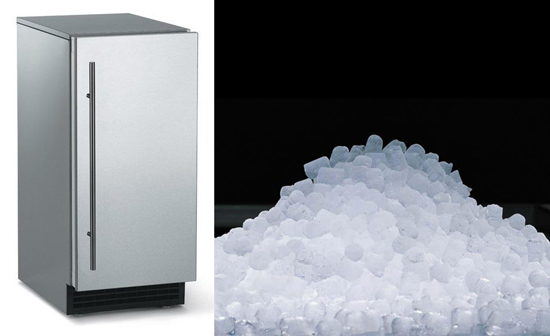 Scotsman has finally anwsered the call and created a residential nugget ice machine that’s 15″ wide and fits under your couter. Bravo!! Brilliance by Scotsman is one of the most energy-efficient machines on the market. Not only does Brilliance produce approximately 50 pounds of ice per day, The innovative technology enables the cuber to use less than half the energy and one-third the water of Scotsman’s previous residential ice machine. Brilliance ice machines produce crystal-clear, taste-free and odorless cubes to enhance the beverage experience. The Scotsman ice cubes will not change the flavor of the drinks, whereas ice from a refrigerator can due to minerals in the water and absorbed odors. The new Brilliance is one of the smartest, most convenient ice machines available for the home. An electronic control panel clearly communicates the machine’s ice production status and maintenance needs. LED indicators let the user know the machine is on and can alert the user to a no-water condition, and when it is time to clean. Apply 3M Fasara Decorative Window Films to glass to create beautiful privacy screens, partitions and architectural statements at a fraction of the cost of etched glass. Fasara films also block up to 99% of the UV light to reduce fading and protect valuable interiors. It is thin, durable polyester with a decorative matte surface that provides a decorative privacy screen on the interior surface of a window. 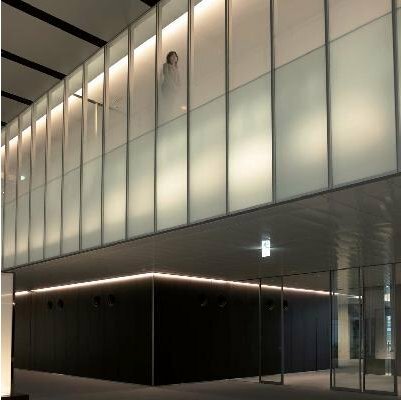 The films closely resemble sand blasted or acid-etched glass and also help with visibility through the glass for privacy features, while adding a nice stylish look to any office or home. Decorative window films create a serene, etched-glass appearance, reminiscent of the rice paper partitions to divide interior spaces. Cheers and thanks for reading Life of an Architect.